The Mercedes Benz CLK cabriolet, the Czech market leader in its class, affords four passengers very pleasant and agile cruising. In addition, the broad spectrum of engines, colors, and accessories allows the customer to choose exactly the car he or she wants. THE 4.64-METER-LONG CLK cabriolet has a long body with four full seats and a hydraulically controlled folding, classic convertible top. The multi-layered roof collapses or is deployed in 20 seconds, and it comes with a remote control. When the roof is down there are 276 liters of luggage space, or 390 liters when up. The cabriolet comes with safety equipment that is activated when the car is in great danger of turning over, whether the roof is up or down. An electronic sensor sends an instant instruction, and in 0.3 seconds strong protective arches rise behind the back seats. Up front an extremely tough windshield frame serves the same purpose. 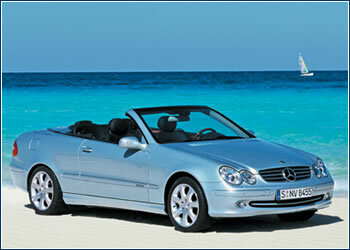 The CLK cabriolet, with rear-wheel drive, is mainly a car for sheer driving pleasure. The CLK 200 K model sells for CZK 1.379 million and comes with a supercharged, four-cylinder, 1.8-l engine that turns out 163 hp (120 kW). The CLK 240, for CZK 1.471 million, has a 2.6-l, 170 hp (125 kW), V6 that drives it to over 230 km/h. Both models come with six-speed manual transmissions, and the more expensive cabriolets have five-speed automatic transmissions standard. The CLK 320, with a six-cylinder, 3.2-l, 218 hp (160 kW) engine that can reach 240 km/h, sells for CZK 1.69 million. The CLK 500, which costs CZK 2.265 million, is driven by a 5.0-l, 306 hp (225 kW), V8. The top of the line is the CLK 55 AMG cabrio, with a 5.4-l, 367 hp (270 kW) V8. Like the CLK 500, its top speed is electronically limited to 250 km/h, and it accelerates from 0 to 100 km/h in 5.4 seconds. The CZK 2.79 million price tag reflects the joy the car promises.